Upskilling the local supply chain to improve their performance on tenders and once they get to the site, so that they are better able to compete for work. We are currently constructing a new bridge and highway in Dalton Lane (approximately 6.5km south-west of Thirsk), just east of the village of Topcliffe, and while there we have teamed up with local football club Thirsk Falcons to provide the U13 team with a new kit. 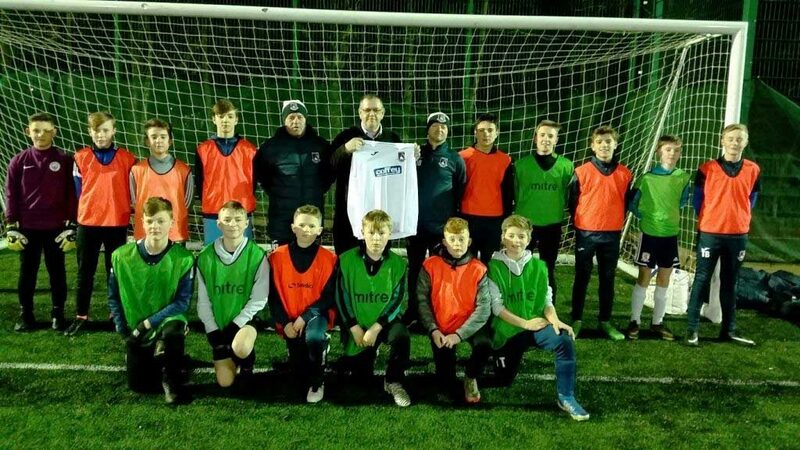 Andy Burton, Project Manager at Coffey Construction, pictured presenting the Thirsk Falcons under 13 team with their new kit. Coffey Group is now the proud sponsors of Tuam Swimming Club. We are providing the club with sports equipment for athletes of all levels. 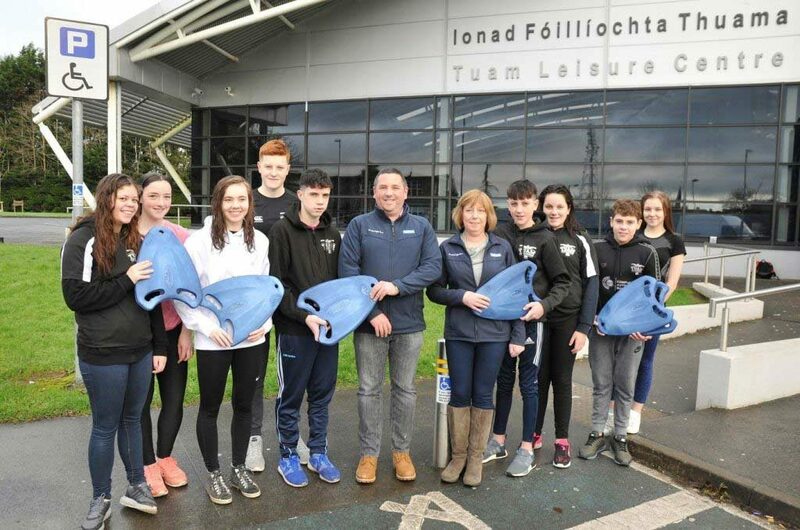 Sean and Olivia Coffey from Coffey Group pictured with members of the Tuam swimming team at the announcement of our sponsorship of the club in January 2018. Supporting charities, both local and national, is part of the culture at Coffey Group. Our staff have raised much-needed money for small local charities and even made taking part in national fundraisers social occasions. Some of the charities that we have supported recently include Croi Heart and Stroke Charity, Cancer Care West, Macmillian Cancer Support and Movember. 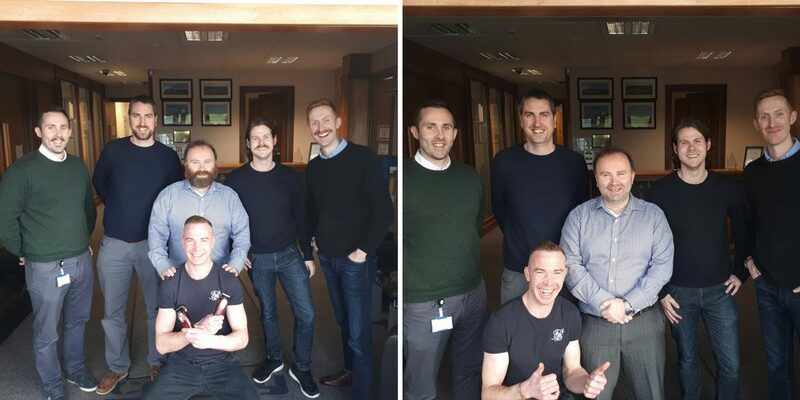 Coffey Group staff members Danny Flynn, James Sheehan, Sean Coffey, Keith Connolly and Michael Madden pictured (before and after the big shave) with barber Padraic from The Barber Shop, Athenry, at our head office at our Movember fundraiser. 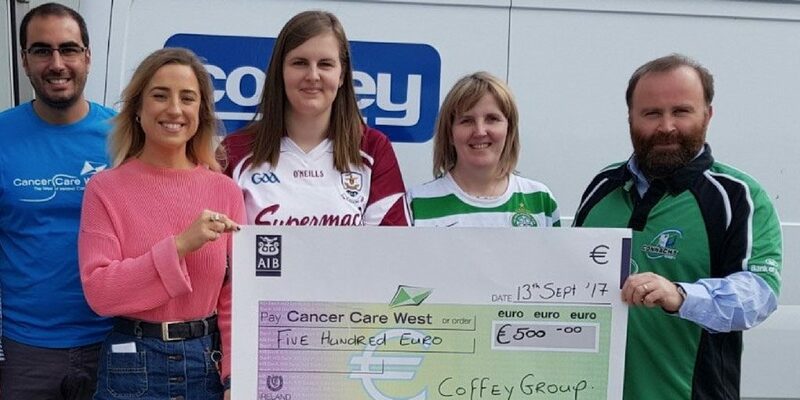 The Coffey team raised an impressive €1730 for men’s’ cancer research. 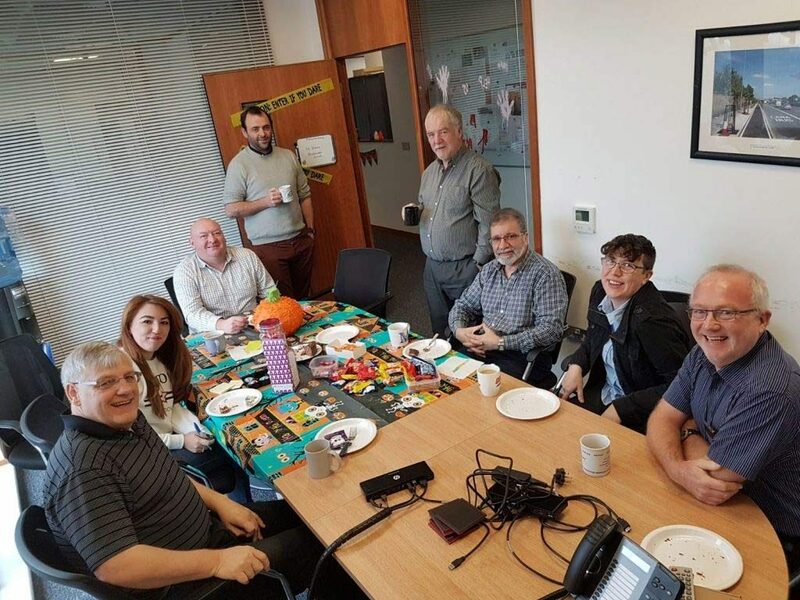 The team at our St Helen’s office took a laid-back approach to the Halloween festivities with a coffee morning in aid of the Macmillian Cancer Support raising £324. Pictured at the cheque presentation following our head office Jersey Day fundraiser for Cancer Care West were David Solla Sobral, Rachel Dooley from Cancer Care West, Rebecca McDermott, Cheryl Winston and Sean Coffey. We are passionate about what we do, and we are always looking for enthusiastic individuals to join our team. This year we have been busy attending career days all over Ireland and the UK to show students and soon-to-be graduates the benefits of the career in the civil engineering industry. 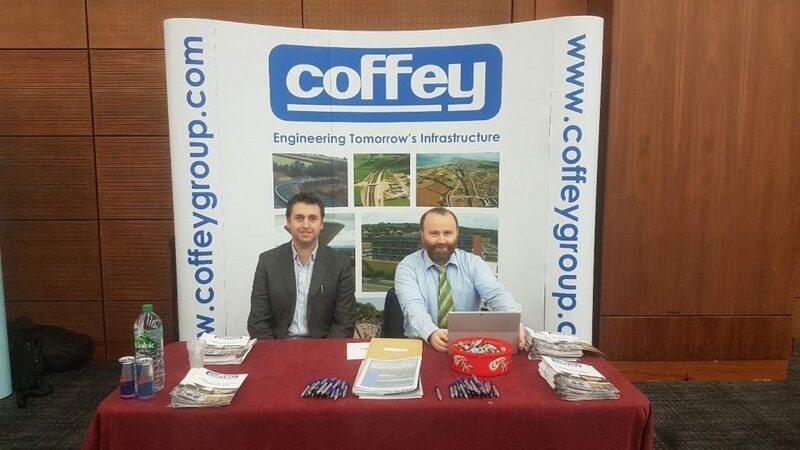 Alan Grady and Sean Coffey representing Coffey Group at a career event in NUIG. Coffey Group recognises that slavery and human trafficking remains a hidden blight on our global society. The aim of Coffey Group is to identify our responsibility by alerting staff to the risks, however small, in our business and in the wider supply chain. Staff are expected and encouraged to report concerns to management, where they are expected to act upon them this policy applies to all those employed by Coffey Group. For a copy of our full Policy Document please click HERE. Coffey Group is committed to implementing and enforcing effective systems to counter bribery. For a full copy of Coffey Groups Anti-Bribery Policy click HERE. Coffey Group Whistleblowing Policy is intended to encourage Board members, employees and others to report suspected or actual occurrence(s) of illegal, unethical or inappropriate events (behaviours or practices) without retribution. For a full copy of the Coffey Groups Whistleblowing Policy click HERE. Achilles operates the UVDB supplier management service on behalf of all the major UK utility organisations. By registering and pre-qualifying our company with this service we have become part of a utilities industry-wide scheme. This independent review and assessment audit ensures that the Coffey Group maintains its position and registration to the utility industry UVDB Verify Certification Scheme. Click HERE for the certificate. The Coffey Group are registered and audit qualified to the Achilles Supply line supplier management service in Ireland, Achilles Supply line is a Supplier management community for the Irish utilities, transport, oil & gas and private sectors. Click HERE for the certificate. The Coffey Group are members of the UK’s largest pre-qualification database; Constructionline. Constructionline is the UK’s largest register of contractors and consultants for the construction industry. Click HERE for the certificate. The Coffey Group are committed to partnering and collaboration in the Civil, Building and Environmental Engineering Industry and the benefits that can bring to the organisation. We are committed to putting in place, initiatives to improve procurement and project delivery through early design team engagement, contractor involvement in the design and cooperative client relationships. Click HERE for the certificate.